A common denominator among the multiple damage-inducing agents that ultimately lead to activation of NLRP3 has not yet been identified. Recently, production of reactive oxygen species (ROS) has been suggested to act as a common event upstream of the NLRP3 inflammasome machinery. Because de novo translation of NLRP3 is an essential step in the activation of NLRP3, we investigated the role of substances that inhibit either ROS production or its oxidative activity. Although we observe that NLRP3 inflammasome activation is unique among other known inflammasomes in its sensitivity to ROS inhibition, we have found that this phenomenon is attributable to the fact that NLRP3 strictly requires priming by a proinflammatory signal, a step that is blocked by ROS inhibitors. Although these data do not exclude a general role for ROS production in the process of NLRP3-triggered inflammation, they would put ROS upstream of NLRP3 induction, but not activation. Interleukin-1β–driven inflammation plays a pivotal role both in antimicrobial immunity and in many sterile inflammatory conditions. Owing to the highly proinflammatory potential of bioactive IL-1β, its release is a tightly controlled process, in which caspase-1–mediated cleavage of pro–IL-1β is a rate-limiting step (1). Inflammasome complexes control the regulated cleavage of pro–IL-1β and also other procytokines by assembling a multicomponent protein platform that leads to the activation of procaspase-1. In addition, the activation of inflammasome pathways leads to a special type of inflammatory cell death that is commonly referred to as pyroptosis. So far, several proteins have been described that can initiate the formation of inflammasome complexes: the nucleotide-binding domain leucine-rich repeat (NLR) proteins NLRP1, NLRP3, and NLRC4 and the pyrin and HIN200 domain-containing protein AIM2. Up to now, only AIM2 has been shown to directly bind to its activating stimulus (dsDNA) (2–4), whereas the NLR inflammasome proteins have not been established as bona fide receptors. Of all of the NLR proteins, NLRP3 has attracted particular attention because it seems to sense a large variety of stimuli of diverse physiochemical nature [e.g., ATP, pore-forming toxins, or crystalline material (5–7)] and also because it plays a pivotal role in many inflammatory diseases. Prior to the discovery of NLRP3 as an upstream component of caspase-1 activation, it was already known that ATP critically requires a proinflammatory priming step (e.g., LPS) for caspase-1 activation (8, 9). Moreover, priming cells is also necessary for caspase-1 cleavage after exposure to pore-forming toxins and crystalline inflammasome activators. We have recently shown that induction of NLRP3 expression is the only critical factor that determines the necessity of this priming step (10, 11). In fact, this requirement for priming can be overcome solely by constitutive NLRP3 expression, as macrophages expressing heterologous NLRP3 do not require proinflammatory priming for their responsiveness toward ATP or other NLRP3 activators (10). As trivial as this necessity for priming might appear, it is important to consider when studying mechanisms of NLRP3 activation or when exploring strategies to specifically inhibit NLRP3 activation. Various models of activation have been proposed for NLRP3, and, most recently, the concept of reactive oxygen species (ROS) being upstream of NLRP3 activation has gained particular attention. Previous studies using RNA interference and pharmacological inhibitors suggested that NADPH oxidase (NOX)-dependent ROS production, which is observed upon phagocytosis of crystalline material, would be upstream of NLRP3 inflammasome activation (12). However, we and others (13–15) found that macrophages deficient in NOX subunits p47phox, p91phox, or p22phox (essential for functional NOX1-4) responded normally to NLRP3 stimulation (Supplemental Fig. 1A–D). Nevertheless, inhibitors of ROS production or scavengers of ROS exhibit a strong inhibition of NLRP3 inflammasome activation (12, 16). Indeed, in line with the notion that mitochondria constitute the biggest source of cellular ROS, it was subsequently shown that mitochondria are, in fact, the site of ROS production during NLRP3 inflammasome activation (17, 18). To this effect, it has also been demonstrated that inhibitors of mitochondrial ROS production (17) and the knocking down of mitochondrial respiration by targeting the expression of voltage-dependent anion channels (18) downmodulate NLRP3-mediated inflammasome activation. Furthermore, independent evidence also exists that ROS activate proinflammatory transcription factors (19, 20) and that ROS production positively regulates proinflammatory gene expression in various innate immune signaling pathways (14, 21). On the basis of these findings, we hypothesized that ROS inhibition does not directly affect activation of the NLRP3 inflammasome, but, instead, negatively regulates the priming step of NLRP3 inflammasome activation. Wild-type C57BL6/J, Ncf1m1J/J, and Cybb mutant mice in C57BL6/J background were purchased from The Jackson Laboratory, and bones from Cyba mutant mice were kindly provided by Dr. David Bergstrom (The Jackson Laboratory) and have been previously described (22). All animal studies were approved by the University of Michigan Committee on Use and Care of Animals. C57BL/6 or NLRP3-deficient macrophage cell lines (Figs. 1, 2; Supplemental Figs. 1E, 1F, 2) were cultured and stimulated as previously described (10). Macrophages stably overexpressing NLRP3 were obtained through lentiviral transduction, as explained earlier (10). ATP, poly(deoxyadenylic-deoxythymidylic) [poly(dA:dT)], nigericin, cycloheximide (CHX), and N-acetyl-l-cysteine (NAC) were from Sigma-Aldrich. Diphenyliodonium (DPI) was from Alexis. Flagellin and ultrapure LPS from Escherichia coli were from Invivogen. Silica (U.S. Silica) was used at a final concentration of 500 μg/ml. Poly(dA:dT) and flagellin were transfected using Lipofectamine 2000 (Invitrogen) and 1,2-dioleoyloxy-3-(trimethylammonium)propane (DOTAP; Roche Applied Science), respectively. If indicated, 5 μM nigericin or 5 mM ATP was added 1 h before supernatants were collected. Caspase-1 cleavage was detected by immunoblot, as previously described [(Figs. 1, 2; Supplemental Figs. 1E, 2) (10) or (Supplemental Fig. 1C, 1D) (11)]. NLRP3 expression was assessed using the Cryo-2 Ab from Axxora. RNA from macrophages was reverse transcribed, and quantitative PCR analysis was performed on a Roche LC480. All gene expression data are presented as relative expression to HPRT1. Primer sequences are available upon request. NLRP3 inflammasome activation is tightly controlled by a priming step that requires de novo translation (10, 11). To address whether other inflammasome pathways also require de novo translation, we carried out experiments in murine macrophages treated with the translation inhibitor cycloheximide. These cells were then treated with prototypical stimuli of the NLRP3 inflammasome (LPS/nigericin), the AIM2 inflammasome [poly(dA:dT)], or the NLRC4 inflammasome (flagellin) and then monitored for caspase-1 activation as a direct readout for inflammasome activation. As previously shown, NLRP3 inflammasome activation was critically dependent on the presence of LPS and abrogated by cycloheximide treatment (Fig. 1A, upper panel). Macrophages transduced to constitutively express NLRP3 at levels that equal those of LPS-primed macrophages (Supplemental Fig. 1E) did not require LPS priming, and inhibition of de novo translation had no impact on NLRP3 activation in these cells (Fig. 1A, lower panel). Conversely, activation of the AIM2 or the NLRC4 inflammasome was independent of LPS priming. Moreover, even though AIM2 and NLRC4 ligands can serve as proinflammatory priming signals themselves, complete blockage of de novo translation by cycloheximide also did not inhibit their activation of caspase-1. Similarly, IL-18, which is constitutively expressed in macrophages, was released in cycloheximide-treated macrophages when stimulated via NLRC4, but not when stimulated via NLRP3 (Supplemental Fig. 1F). Careful titration of cycloheximide indicated that the inhibitory effect on NLRP3 activation was dose dependent (Fig. 1B) and that AIM2 or NLRC4 could be activated even at high concentrations of cycloheximide. The specific role of priming for NLRP3 inflammasome activation was reflected by the fact that NLRP3 was highly inducible in response to proinflammatory stimuli such as LPS. Of interest, LPS priming enhanced neither the expression of NLRP1a nor that of NLRP1b, NLRC4, AIM2, caspase-1, or ASC. As expected, IL-1β was highly inducible upon LPS priming (Fig. 1C). Similar results were obtained for other TLR ligands such as Pam3Cys (TLR2) or R848 (TLR7/8) (data not shown). 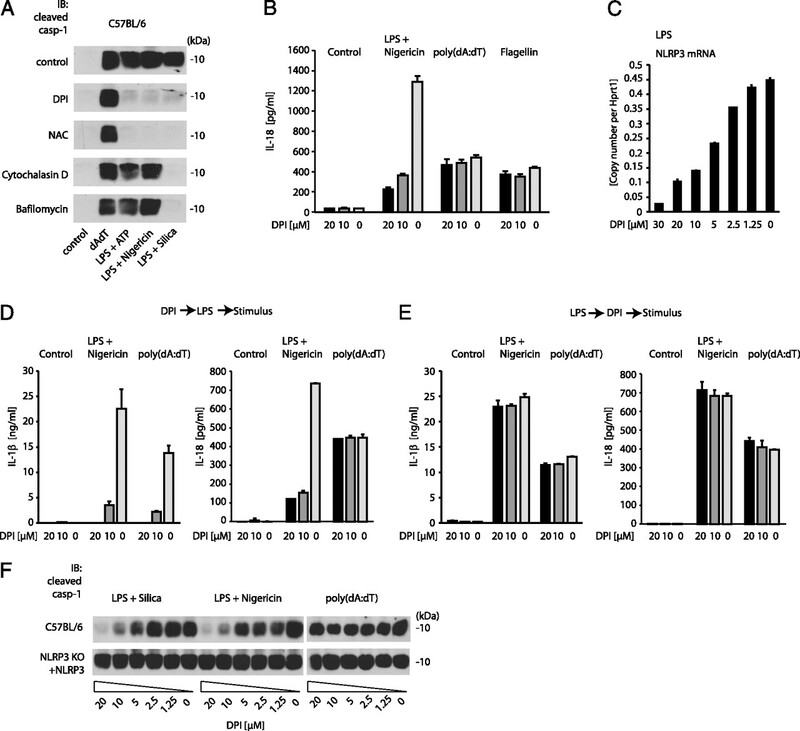 Altogether, these data indicated that NLRP3 is unique among the known inflammasome pathways in its specific requirement of a proinflammatory priming signal. The requirement of priming is a distinctive feature of the NLRP3 inflammasome. A, Immunoblot of cleaved caspase-1 from supernatants of wild-type (C57BL/6), NLRP3-deficient, or NLRP3-deficient macrophages reconstituted with NLRP3 (NLRP3-KO + NLRP3) treated with 100 ng/ml CHX or left untreated. Stimulation was performed as indicated. B, Immunoblotting of caspase-1 from supernatants of wild-type macrophages pretreated with CHX for 1 h and stimulated as indicated. C, mRNA expression in LPS-primed (200 ng/ml) or untreated macrophages. Relative expression data per Hprt1 are shown. Readouts were performed 6 h (A, B) or 3 h (C) after stimulation, and data are from one representative experiment of three (A, B) or of four (C) experiments. DPI is a competitive inhibitor of flavin-containing cofactors and is thus a potent inhibitor of NOX-dependent ROS production (23). At the same time, DPI also blocks mitochondria-derived ROS production, although higher concentrations are required for this effect (21, 24). NAC, in contrast, functions as a scavenger of ROS regardless of the source of production. ROS inhibitors have been reported to potently inhibit NLRP3 activation (12, 16) and, in line with this finding, we observed that both DPI and NAC potently inhibited caspase-1 activation in response to various NLRP3 stimuli (LPS/ATP, LPS/nigericin, or LPS/silica), yet not in response to AIM2 activation [poly(dA:dT)]. NLRP3 stimuli that require phagosomal uptake and acidification, such as silica, were also inhibited by cytochalasin D or bafilomycin A (Fig. 2A). Moreover, IL-18 release in response to NLRP3 stimulation, but not AIM2 or NLRC4 stimulation, was inhibited by DPI as well (Fig. 2B). Measuring IL-1β release in response to NLRP3 activation confirmed the caspase-1 and IL-18 activation data. However, ROS inhibition blocked AIM2-mediated IL-1β release equally potently (Supplemental Fig. 2A). In fact, assessing IL-1β expression at the protein level in cell lysates or at the mRNA level using real-time PCR revealed that ROS inhibitors downmodulated LPS-mediated IL-1β expression per se (Supplemental Fig. 2B). At the same time, the expression of other proinflammatory genes such as TNF was also blocked by ROS inhibitors (Supplemental Fig.2C). In accordance with this observation, ROS inhibition dose-dependently inhibited the expression of NLRP3, which is also induced in response to proinflammatory signals (Fig. 2C). On the basis of these findings, we speculated that ROS inhibitors block NLRP3 inflammasome activation because NLRP3 upregulation is inhibited. To address this assumption, we performed experiments in which we added DPI before or after LPS priming. Given its constitutive and thus priming-independent expression, only IL-18 as a readout of inflammasome activation suggested an NLRP3-specific inhibitory effect of DPI pretreatment. IL-1β release was again completely blocked in DPI-pretreated macrophages stimulated with either nigericin or poly(dA:dT) (Fig. 2D). Moreover, we observed an inhibition of NLRP3 activation only when macrophages were treated with DPI before, but not after, prolonged LPS priming (Fig. 2E). To further address the hypothesis that DPI blocks NLRP3 inflammasome activation by inhibiting its upregulation, we re-evaluated ROS inhibitors in macrophages stably expressing NLRP3. Indeed, although DPI blocked NLRP3 activation in wild-type macrophages stimulated with LPS/silica or LPS/nigericin, no inhibition of caspase-1 activation was observed when NLRP3 expression was uncoupled from the priming signal by stable overexpression (Fig. 2F). Analogous data were obtained when NAC was used to block ROS (Supplemental Fig. 2D–G). As a whole, these data indicate that ROS inhibitors block NLRP3 inflammasome activation by interfering with the priming step that is required to induce NLRP3 expression, whereas direct NLRP3 activation is not affected. In this regard, the specificity of ROS inhibitors for the NLRP3 inflammasome can be explained by the fact that the NLRP3 inflammasome is critically dependent on priming because NLRP3 is expressed at limiting levels in unprimed macrophages. AIM2- or NLRC4-mediated caspase-1 activation, in contrast, is not affected by ROS inhibition, given their constitutive expression and thus independence of de novo translation. Not only are these findings important for our understanding of the mechanistics of NLRP3 activation, but they also have critical implications for the development of drugs that specifically block NLRP3-mediated inflammation without affecting proinflammatory transcription in general. In this regard, we would favor approaches that explore inhibitory strategies in the setting of constitutive NLRP3 expression. Inhibitors of the ROS system block NLRP3-mediated caspase-1 activation by inhibiting cell priming. A, Wild-type macrophages were pretreated for 1 h with DPI (20 μM), NAC (20 mM), cytochalasin D (5 μM), or bafilomycin (250 nM), then stimulated as indicated and subsequently assessed for cleavage of caspase-1. B, Wild-type macrophages were pretreated for 1 h with 0, 10, or 20 μM DPI, then stimulated as indicated; subsequently, IL-18 release was measured by ELISA. C, Wild-type macrophages were treated with ascending doses of DPI, subsequently primed with LPS, and then assessed for NLRP3 mRNA expression. D and E, Wild-type macrophages were treated with DPI (1 h) and then primed with LPS (3 h); alternatively, macrophages were primed with LPS (3 h), then treated with DPI (1 h) and subsequently stimulated as indicated. Six hours following stimulation, IL-1β and IL-18 release was assessed in the supernatant. F, Cleaved caspase-1 of wild-type and NLRP3-deficient macrophages reconstituted with NLRP3 is depicted. Data from one representative experiment of two (A, B, D, E) or three (C, F) are presented. We thank Millennium Pharmaceuticals for providing NLRP3-deficient mice and E. Latz for discussion. This work was supported by grants from the German Research Foundation (SFB704 and SFB670), the European Research Council (ERC-2009-StG 243046) (to V.H. ), and the National Institutes of Health (R01AI063331) (to G.N.) and by a Career Development award from the Crohn’s and Colitis Foundation of America (to L.F.). 2009. Immunological and inflammatory functions of the interleukin-1 family. Annu. Rev. Immunol. 27: 519–550.
. 2009. AIM2 recognizes cytosolic dsDNA and forms a caspase-1-activating inflammasome with ASC. Nature 458: 514–518.
. 2009. An orthogonal proteomic-genomic screen identifies AIM2 as a cytoplasmic DNA sensor for the inflammasome. Nat. Immunol. 10: 266–272.
. 2009. AIM2 activates the inflammasome and cell death in response to cytoplasmic DNA. Nature 458: 509–513.
. 2006. Bacterial RNA and small antiviral compounds activate caspase-1 through cryopyrin/Nalp3. Nature 440: 233–236.
. 1950. 2000. Kinetics and mechanism of ATP-dependent IL-1 beta release from microglial cells. J. Immunol. 164: 4893–4898.
. 1950. 2005. Potentiation of caspase-1 activation by the P2X7 receptor is dependent on TLR signals and requires NF-kappaB-driven protein synthesis. J. Immunol. 175: 7611–7622.
. 2009. 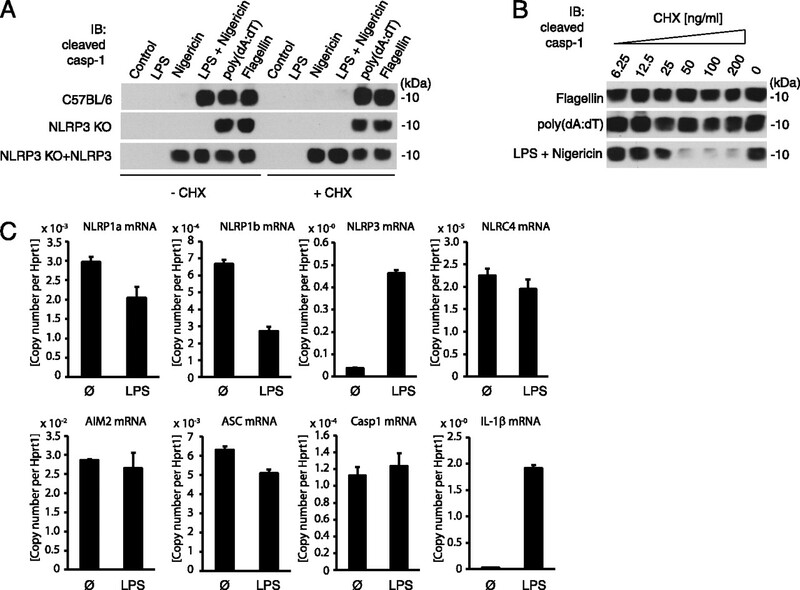 Cutting edge: NF-kappaB activating pattern recognition and cytokine receptors license NLRP3 inflammasome activation by regulating NLRP3 expression. J. Immunol. 183: 787–791.
. 2009. Cutting edge: TNF-alpha mediates sensitization to ATP and silica via the NLRP3 inflammasome in the absence of microbial stimulation. J. Immunol. 183: 792–796.
. 2008. Innate immune activation through Nalp3 inflammasome sensing of asbestos and silica. Science 320: 674–677.
. 2010. Human NLRP3 inflammasome activation is Nox1-4 independent. Blood 115: 5398–5400.
. 2010. Reactive oxygen species-independent activation of the IL-1beta inflammasome in cells from patients with chronic granulomatous disease. Proc. Natl. Acad. Sci. U. S. A. 107: 3030–3033.
. 2010. Inflammasome activation in NADPH oxidase defective mononuclear phagocytes from patients with chronic granulomatous disease. Blood 116: 1570–1573.
. 2008. The Nalp3 inflammasome is essential for the development of silicosis. Proc. Natl. Acad. Sci. U. S. A. 105: 9035–9040.
. 2011. Autophagy proteins regulate innate immune responses by inhibiting the release of mitochondrial DNA mediated by the NALP3 inflammasome. Nat. Immunol. 12: 222–230.
. 2011. A role for mitochondria in NLRP3 inflammasome activation. Nature 469: 221–225.
. 2005. Reactive oxygen species promote TNFalpha-induced death and sustained JNK activation by inhibiting MAP kinase phosphatases. Cell 120: 649–661.
. 2003. Hydrogen peroxide activates NF-kappa B through tyrosine phosphorylation of I kappa B alpha and serine phosphorylation of p65: evidence for the involvement of I kappa B alpha kinase and Syk protein-tyrosine kinase. J. Biol. Chem. 278: 24233–24241.
. 2011. Mitochondrial reactive oxygen species promote production of proinflammatory cytokines and are elevated in TNFR1-associated periodic syndrome (TRAPS). J. Exp. Med. 208: 519–533.
. 2008. Mutation of the Cyba gene encoding p22phox causes vestibular and immune defects in mice. J. Clin. Invest. 118: 1176–1185.
. 1987. The inhibition by diphenyleneiodonium and its analogues of superoxide generation by macrophages. Biochem. J. 242: 103–107.
. 1972. Biochemical effects of the hypoglycaemic compound diphenyleneiodonnium. Catalysis of anion-hydroxyl ion exchange across the inner membrane of rat liver mitochondria and effects on oxygen uptake. Biochem. J. 129: 39–54.